Ina Cernusca is a research specialist with the North Dakota Compass project and the Center for Social Research at NDSU. As a part of the ND Compass team, Ina contributes to the project by creating and implementing strategies to continually grow and improve the quality of the website, by developing and monitoring performance measures, implementing impact evaluation methods, and conducting research projects associated with ND Compass.. The North Dakota’s Women 2016 study was developed by the North Dakota Compass team at the Center for Social Research at NDSU. The study was created for the North Dakota Women’s Network with financial support from the Otto Bremer Trust and designed to inform state and local leaders, education and outreach professionals, business and community leaders, interest groups, and North Dakota residents about the characteristics of women in the state. This article provides a brief summary of the key findings presented in the study. •	In recent years, North Dakota has experienced unprecedented population growth in response to an expanding economy. The recent population growth in the state, however, has not been gender balanced. 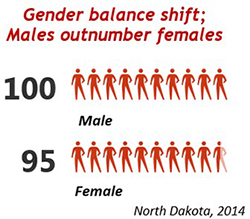 North Dakota is one of few states where males outnumber females. While the U.S. population of males and females of all ages increased consistently from 2000 to 2014, with females outnumbering males, the male population in North Dakota increased at a higher rate than the female population. From 2000 to 2014, the male population in North Dakota increased by 18 percent compared to a 12 percent increase in the female population. In 2014, the male population outnumbered the female population with 95 females for every 100 males. •	Racial and ethnic diversity has grown in North Dakota since 2000. While the percentage of White females in the total female population decreased from 93 percent in 2000 to 89 percent in 2014, the population Of Color (i.e., Non-White) increased in number and as a percentage of the total female population for each racial and ethnic group. However, despite these changes, North Dakota is less racially and ethnically diverse than most states, ranking 44th out of 50 states. •	Family composition has also changed in North Dakota. The percentage of women, 15 years and older, who have never been married increased while the percentage of married women decreased. 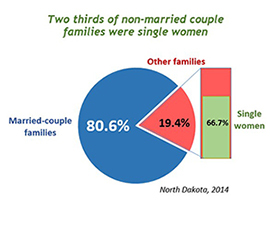 Married-couple families represented 81 percent of all North Dakota families in 2014. 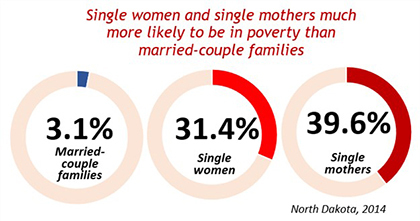 Of non-married couple families, two-thirds were single women. Additionally, two-thirds of single women were single-mothers with children under 18 years old. •	North Dakota women made progress in educational attainment in the past five years. The percentage of women with less than a high school diploma decreased from 11 percent in 2009 to 8 percent in 2014 while the percentage of women who completed more than high school increased. Compared to men in North Dakota, a larger percentage of women have had a bachelor degree or higher since 2007. In 2014, 30 percent of women, age 25 years and older, had a bachelor’s degree or higher, as compared to 25 percent of their male counterparts. •	Women in North Dakota have strong labor force participation rates. The labor force is composed of civilians 16 years old and older, employed and unemployed people who are currently looking for work, plus members of the U.S. Armed Forces. Two-thirds of North Dakota’s women were in the labor force in 2014. Among North Dakota’s families, 62 percent of married-couple families had both the husband and wife in the labor force in 2014. Additionally, 77 percent of single women and 84 percent of single mothers were working outside of the household or actively looking for work. 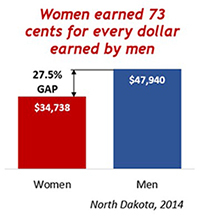 •	The women to men earnings gap increased in North Dakota over the past 10 years. In North Dakota, women age 16 and older, working full-time, year-round, had median earnings of $34,738 in 2014, which is $13,202 less than their male counterparts. This means that women earned about 73 cents for every dollar earned by men. The gap has widened over the past few years, likely due to the higher-paying energy development jobs in western North Dakota, which have attracted more men than women. •	Business ownership can bring women independence, certain lifestyle advantages, financial rewards, and personal satisfaction. 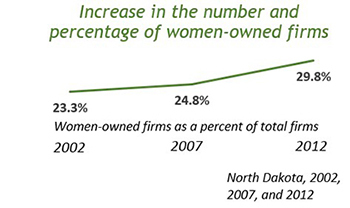 In North Dakota, there were 20,316 firms owned by women in 2012. An additional 8,561 firms were owned by women and men equally. Although the number and percentage of women-owned firms in North Dakota increased from 2002 to 2012, women were still less likely than men to own a firm in 2012. •	Although women have access to education and employment, many of them still struggle to reach a minimum standard of living and well-being. In North Dakota, 12 percent of women age 16 and older, lived below the poverty level as compared to 9 percent of men in 2014. As education levels increase, poverty rates decrease. In North Dakota, slightly more than one-fourth of women with less than a high school education were in poverty in 2014, which is seven times the poverty rate for women with a bachelor’s degree or higher. However, higher education does not necessarily guarantee incomes above the poverty level. In 2014, half of women in poverty in North Dakota had a post high school education; 37 percent had some college or associate’s degree; and 13 percent had a bachelor’s degree or higher. At the family level, single women were more likely to be in poverty than married-couple families, and even more so when children were present. •	According to the 2014 Behavioral Risk Factor Surveillance Survey (BRFSS), 54 percent of women age 18 and older in North Dakota reported excellent or very good general health, 32 percent reported good health, and 14 percent reported fair or poor health. 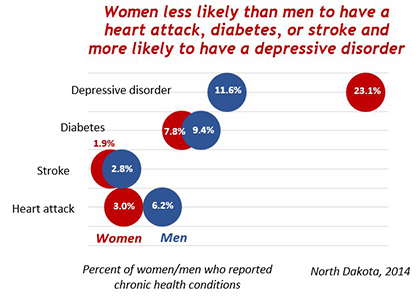 According to this data source, North Dakota women were less likely than men to have diabetes, a stroke, and a heart attack in 2014. However, women were twice as likely as men to report having a depressive disorder. 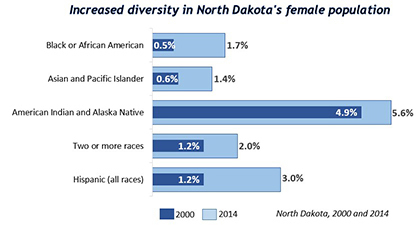 As presented above, the characteristics of women in North Dakota have been impacted by the dynamic changes in economic and socio-economic conditions in the past 10 years. Substantial in-migration of young workers and an increase in births has resulted in unprecedented population growth. While, according to recently released data, the growth rate has slowed, North Dakota still had the fastest growing population of all states from 2010 to 2016, at 13 percent. The influx of a younger population, mainly men working in higher paying jobs in the energy sector, is associated with increased household income in North Dakota, and has had an impact on the women to men earnings ratio. The change in family structure, with an increase in single women, has had various impacts on women’s education, participation in the labor force, and poverty rate. Understanding the characteristics of women and how they are impacted by recent trends help inform action to reduce challenges and expand opportunities for women in North Dakota.